We've seen a lot of awesome Japanese architecture on Inhabitat, but we've never seen a kimono-styled home in our own state before. Until now. Architect David Jay Weiner was commissioned to build a small weekend home overlooking the Berkshire Hills for a Japanese client who wanted a quiet retreat from New York's busy city life. The light-filled home consists of a single sweeping volume that appears to fold in on itself and features an enviable interior that is chic and understated. 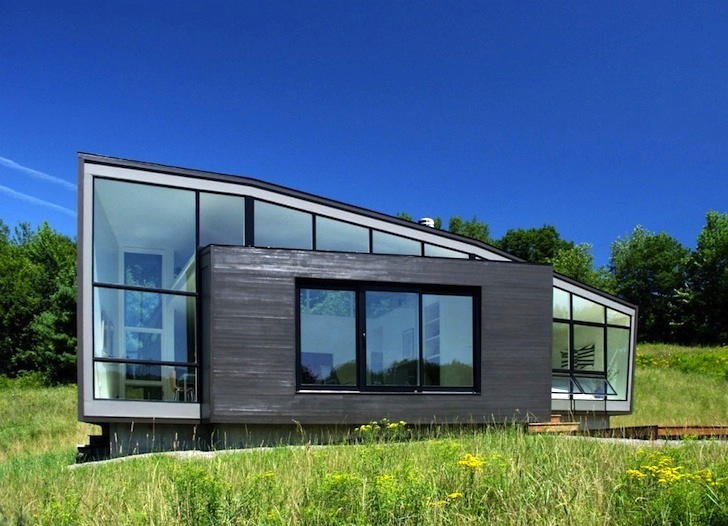 Step in for more details of this beautiful, minimalist home in Rensselaer County. During the summer, the fields in Rensselaer County are populated with the most majestic wildflowers, so it was crucial to leave the plot’s natural landscaping intact. This is exactly what the designers did, while also keeping the overall footprint to an absolute minimum. At just 1,200 square feet, the home not only sits gently on the special terrain but is linked to it via an engawa veranda very common in Japanese structures. All in all, the Weekend House was relatively inexpensive to build and pays utmost respect to its surroundings — and we kinda love it. The gorgeous Weekend House was designed for a Japanese client. During the summer, the fields in Rensselaer County are populated with the most majestic wildflowers, so it was crucial to leave the plot's natural landscaping intact. It is a minimalist, light-filled home. Although the interior is enviably chic, it is still understated. An engawa veranda links the interior to the outdoors. The home has a 1,200-square-foot footprint.